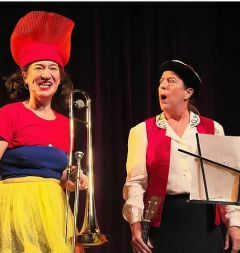 Sarah Liane Foster, performer, creator, and teacher of clown and movement-based theatre has joined forces with Linda Severt who has spent years as a medical clown performer and organizer for New York’s Big Apple Circus Clown Care and now Seattle’s Room Circus. Individually and between the two there are an impressive list of credits that speak to years of family entertainment, international travel, performing and teaching. Now, together, they are a duo clown band called … Kerfuffle!